Elegant and much sought-after map of Asia in original colour from the 1572 or 1574 French edition of the Theatrum Orbis Terrarum published by Christophe Plantin in Antwerp. The Theatrum was the first uniformly-sized, systematic collection of maps ever produced and hence is generally referred to as the first true atlas although the term was not used until 25 years later by Gerard Mercator. 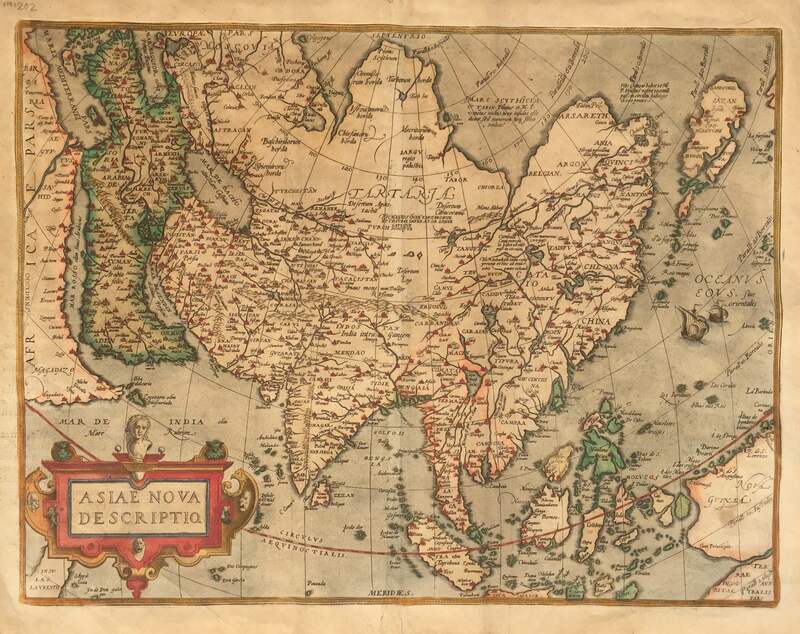 The map of Asia represents a synthesis of the best readily available information on the region from Italian, Portuguese and Spanish sources. Overall condition good with wide margins, two small holes, some professional restoration along the centre-fold and age-toning of paper on verso which has French text; Measures 36.8 x 47.8 cm.